It is impossible to reduce the complexity, liveliness, color, sights and sounds of a trip to Thailasd into a limited number of photographs. Here we present just a few of wonderful scenes that await a visitor to Thailand on a trip with Kasma. Be sure to check out Kasma's albums on Google Photos. It's easiest go to to the Explore Further section below and follow the links to Google Photo albums for individual trips. Trip A is no longer offered. 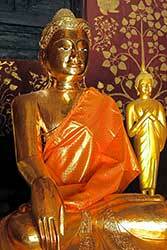 The 17- or 18-day Trip B covers central and northern Thailand – essentially 26-day Trip A without the southern portion. There are two sets of Trip B photos – 1) Older Trip B Photos & 2) Photos From 2009. You can also view the first 40 or so photos from Trip A. Also see: 18-day Trip B Itinerary. White sand beaches! 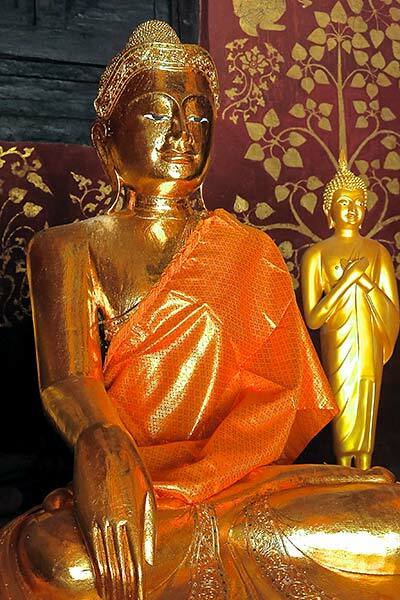 A trip devoted to sothern Thailand featuring snorkeling, exotic cultural visits, seafood feasts and more. Check out the photos from Southern Trip So. Also see the last 20 or so photos from Trip A (in Krabi) and the underwater Photos. Also see: Southern Trip Itinerary | Southern Trip Page. This trip to Northeastern Thailand (Isan) is no longer being offered. Here's some photos of the region for your enjoyment. Some of the best days on the Southern trip (and indeed, two days on Trip A) are spent in the ocean, snorkeling. Here's a collection of underwater photos that will give you an idea of some of the beauty to be seen while snorkeling in Thailand. One of the main areas where Kasma takes you to snorkel on her trips is Krabi province. Here are 55 underwater photos from Krabi that Kasma took in December 2008 & January 2009. 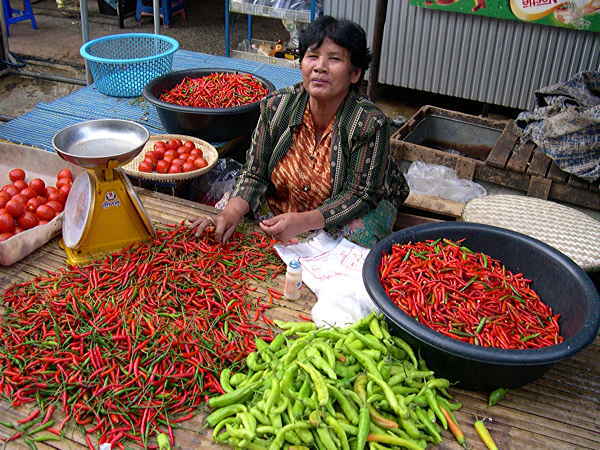 The markets of Thailand are colorful, exciting and appetizing. 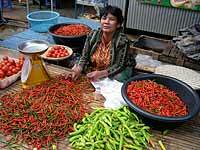 This is a collection of 75 photographs taken by Kasma over the years of markets all over Thailand. The Thai food eaten in Thailand is absolutely spectacular. 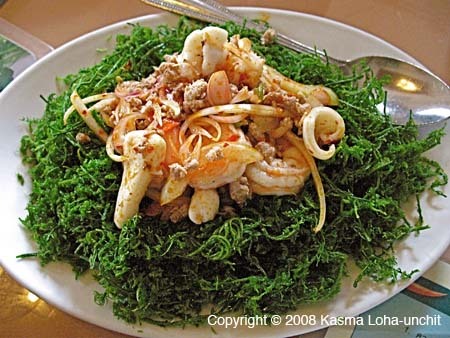 Here you can see a fraction of the dishes eaten on Kasma's trips, much of the food is seldom found outside of Thailand. NE Thailand (Isaan) Fabrics displays some of the lovely fabrics available in this area of Thailand, where many villages have their own distinctive style of silk or cotton cloth. All links go offsite and open in a new window. Follow the links in the "Trip Photos" section below to see Kasma's photos in Google Photos. We suggest that you explore all of the links under Trip Information below. Read each of the Individual Trip Pages to see which you might be interested and then check out the itinerary, contract, blogs (if available) and photos for each trip. If you'd like to sign up, ask question, have us address concerns or would like to talk with a prior trip member, follow this Contact Kasma link and get in touch. Note: All links open in a new window so that you can simply close that window to return to this page of links. Offsite Photos: – Kasma's albums in Google Photos:. Please make sure that you have read the Trip details and the Frequently Asked Questions (FAQs); then Contact Kasma.